It’s that period of the year when script writers are in demand, kavi kola karayas make a killing, and ingenious artists, singers and four to 8-piece bands are laughing all the way to the bank. Not to forget, the stage and platform makers. And the politicians are at your doorstep pleading for your support. Hooray elections are here and who doesn’t love an election, even though your people’s representatives are certainly not doing what they are supposed to do – run local authorities honestly, sincerely, diligently and faithfully. There are many other words ending with ‘ly’ to describe ‘good’ politicians that can fill this column but in Sri Lanka, politicians, for years on end, have let the side down and their constituents. This is not fiction but fact. The good ones join with the promise of changing the world and bringing order to the disorder in the system but then are dragged into a vortex of corruption, lying and thieving and end up justifying their bad deeds. It was in this background that I listened to Kussi Amma Sera (KAS)’s diatribe against a politician contesting the Pradeshiya Sabha (the third tier in local councils after municipalities and urban councils). It appears that the local politician from her village was doing the usual house-to-house campaigning with his coterie of catchers and hangers-on. “Meka ape gama Nangi, apita chande denna,” he had said, grinning from ear to ear. A leaflet extolling his ‘great’ virtues (‘Okkoma boru,” says KAS) had telephone contact numbers including his mobile contact. Kussi Amma Sera says a few hours later, her friend in the village had called the number. A man picked up and asked for a message and said he would give it to the ‘friendly’ local politician. A week later, her friend is still waiting for a response. “Megollangwa kunu bakkiyata daanna watinawa,” KAS says angrily, at the same time spotting a garbage lorry going down the lane and pointing in that direction. It’s all about elections to local authorities on February 10. The poll, according to Mahinda Deshapriya, Chairman of the Election Commission (EC), costs Rs. 4 billion and requires some 300,000 state employees to conduct the massive day-long event. In the fray are hundreds of contestants from different parties vying for over 8,000 seats in 341 councils and an opportunity “to do good to the village, town and city” (what their ‘full of promises’ leaflets say), develop the constituency and in turn ‘line your pockets’! Sitting down with Kussi Amma Sera’s morning concoction of ‘Koththamalli’ and ‘Weniwalgeta’ to get rid of a seasonal cold, I am reminded of Gypsies Sunil Perera’s ‘Bonne Koththamalli’ song. Sunil is the master of satire through song. The phone rings just as I begin humming Sunil’s song. It’s my friend, good-for-nothing ‘Arthika’ Perera looking for a good gossip about upcoming elections. Ironically, he starts the conversation with Sunil’s songs. “Consider these lyrics …. ‘Dan niyama jokerla inne// Api chandeta enne ratey wadekaranna // lakshaganang comis aragena // Lee Kuan Yew raten mehe enne – apey rata hadanna//’. They are hard hitting but in a subtle way. Sunil is a master at satire. Comedy country, I love it,” says ‘Arthika’ Perera happily. We then move on to serious stuff and the elections. “Not all politicians are corrupt,” he says. “Name one?” I ask frowning because I see busybody Kussi Amma Sera, while sweeping the garden, in earshot distance trying to listen to the conversation. “Well the JVP seems to have done a good job in the Tissamaharama Pradeshiya Sabha in 2002 and there are a few other councils that have done well. So, if there is a will, there is a way,” ‘Arthika’ Perera says on a rare, serious note. The man seems to have taken the February 10 poll seriously. On a “let’s hope clean politicians – if ever there is one – wins”, we end the conversation. Reflecting on Sunil Perera’s litany of woes through song, I am reminded of a description of satire: Satire is fascinating stuff. It’s deadly serious and when politics begin to break down, there is a drift towards satire, because it’s the only thing that makes any sense — Ben Nicholson. Another similar description from the website www.brainyquote.com is as follows: Satire is traditionally the weapon of the powerless against the powerful — Molly Ivins. Both describe Sunil and the Gypsies’ effort to bring real issues to the masses in satirical form through song and dance. Commendable indeed. If you can’t change things, at least laugh. No one can take that away from you. Not even the goon squads. While there is generally a feeling that local authorities are a waste of time and don’t work for the people (for that matter provincial councils and parliament are the same), in reality these administrations are closer to the people than any other higher-up elected body. And, due to the new mixed electoral system where 60 per cent of the representatives will be elected from your own village or town, the chances of accountability are greater and the chances of real work by those elected, higher. The last few words “such very basic and simple needs of the people” form the core of the work of local authorities. You need to satisfy the basic needs of the people at local level before tackling the larger issues in the country, at provincial and national level. Maybe, an electoral system where political parties have proved themselves as good, clean administrators at village and town level and then get qualified to contest provincial elections, and thereafter national polls could be a good option to consider. 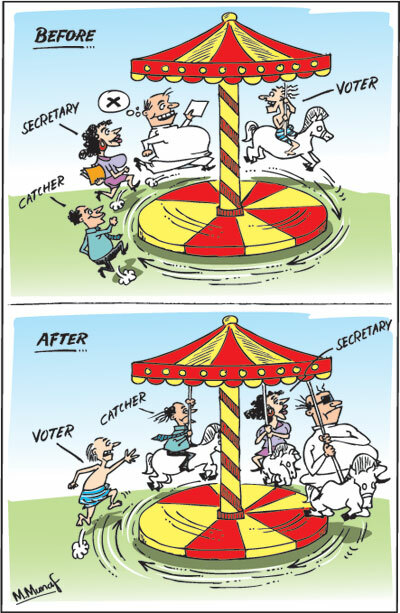 We leave you with this contribution by cartoonist M. Munaf who skilfully captures the merry-go-round of pre-elections and post-elections. Enjoy.